Wash the bell pepper, broccoli, cilantro, spring onions, and snow peas. Slice the snow peas and bell pepper thinly lengthwise. Peel the carrot and slice it very thinly lengthwise as well or use a julienne peeler. Tear apart the oyster mushrooms lengthwise as well. Then chop the spring onions and cilantro thinly. Cut the smoked tofu in cubes. Peel the ginger (the most efficient way is to use a teaspoon instead of a knife), and then chop about 2 – 3 cm (about 1 inch) of its root very thinly. Heat 2 tbsp of the sesame oil in a pan and fry the tofu until crisp and golden. In a large pot, heat 2 tbsp sesame oil and add the spring onions, ginger, cilantro, and red curry paste. Stir continuously for a few minutes. Then add the coconut milk, vegetable stock, and water. Bring to a boil and season with salt and lime juice to taste. Add the vegetables and soba noodles and simmer for about 5 – 10 minutes or until the noodles are done and the veggies are soft. 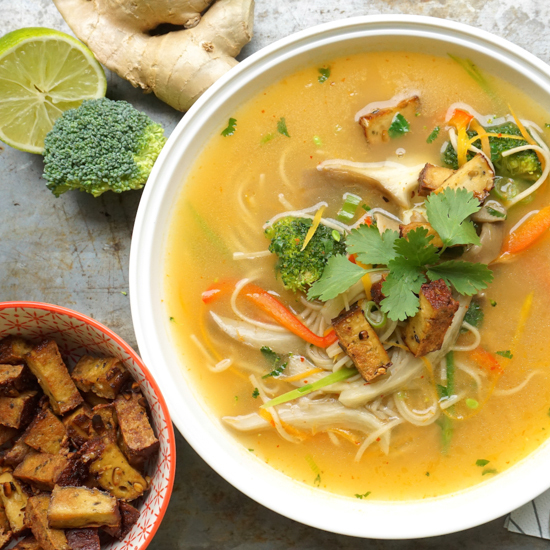 Serve the soup immediately in a nice soup bowl and sprinkle some of the fried tofu cubes and cilantro leaves on top. You can squeeze a little lime juice over the soup as well. 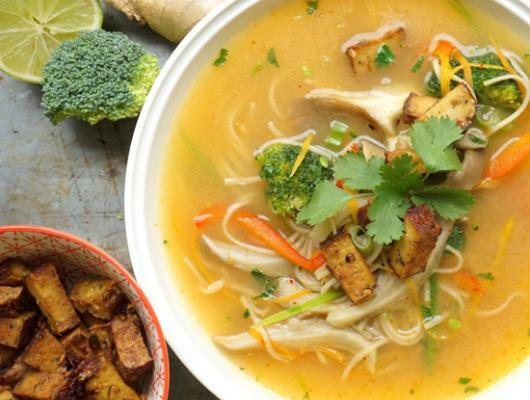 Soba & Vegetable Soup with Red Curry Paste, a delicious vegan winter warming soup to beat the last couple of cold days with lots of heathy ingredients.